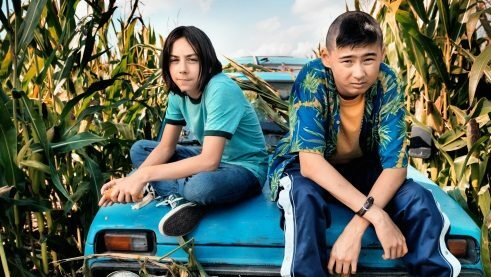 In Goodbye Berlin, Fatih Akin’s adaptation of Wolfgang Herrndorf’s coming of age novel Why We Took the Car, the two actors Anand Batbileg and Tristan Göbel experience the perfect summer. They were on the screen at the Durban International Film Festival (DIFF) in South Africa at the invitation of the Goethe-Institut. 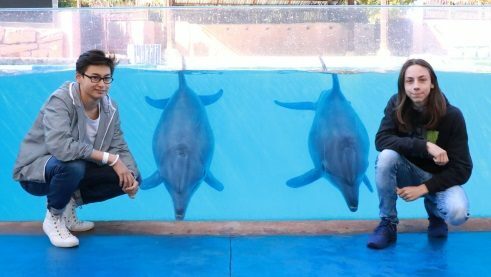 Between the gala opening of Focus Germany and a visit to a dolphin show, we caught up with them for an interview. Anand and Tristan, in Goodbye Berlin you spend most of your time on the road in an old Lada. Have you become good drivers? Tristan: Sure! My family has a little farm outside Berlin and I often drove the pathway to the hayfields in our Volvo. Anand: I learned to drive during the shoot. In most of the scenes there was a stuntman on the roof who steered the car and we pretended to drive, but I was allowed to drive now and then, too. How did you get your leading roles in Goodbye Berlin? Anand: In my case it was sort of a coincidence. 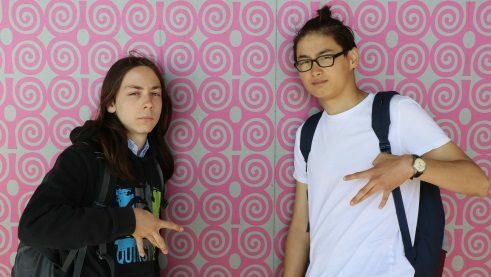 The casting agency was searching for teenagers who looked Mongolian. They contacted my dad who works at the Mongolian Embassy. So I just tried out for fun. At first, I had to send in a couple of videos in which I read prepared lines. Then I was invited and finally got the role and met Tristan for the first time. It was my first acting role ever; I’d never worked in front of a camera before. Tristan: Since we missed our train to the casting in Berlin, I arrived there two hours late and was sent out after only one minute. I thought I’d failed the casting. Then, I met Fatih Akin out in the corridor and we somehow hit it off. I later got the call for the role. How was it to work on the film together? Tristan: I had to wear lifts in my shoes while filming because Anand is two heads taller than I and that had to be balanced out a bit for the camera. 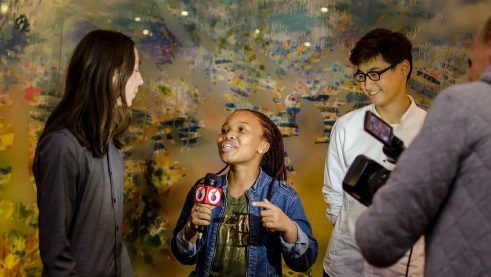 Bonnie Bopela von der südafrikanischen Jugendsendung YoTV interviewt die Hauptdarsteller. Anand, your grandparents live in Mongolia. Do you go there often? I grew up there with my grandparents because my father was working. Lots of families do that in Mongolia. My grandparents visit us a lot in Berlin and I try to travel to Ulan Bator every summer. 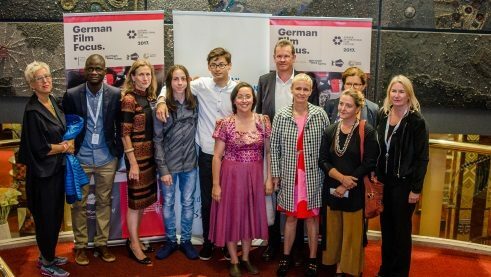 Fatih Akin met almost my entire family at the premiere. Do you ever meet your characters from the film in real life? Anand: I think that there are definitely more Mikes than Tschicks in real life. You know, shy types that aren’t very popular. But Tschick is special. Who would come up with the idea to just steal a car? Were any of the scenes particularly hard to shoot? Tristan: Definitely the scene where Anand talks about our classmate Melanie. Anand: I’m eating gummy bears the whole scene and listing the names of the girls at school. In the later scene where we crash Melanie’s birthday party and begin to dance, we couldn’t stop laughing. Our private tutor played the DJ in that scene, by the way. You’ve shown your films now in a few countries. What kind of impressions did you get? Anand: Going to festivals is always great, especially in Mexico. 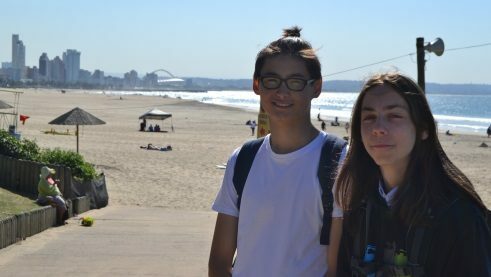 We presented the film there in a huge cinema and were on stage in front of 4,000 people. When we said “Viva Guadalajara,” the audience went wild. The film is about the “best summer.” Have you had your best summer already or is it still ahead of you? Tristan: I think shooting Goodbye Berlin was a pretty good summer.